It’s all too common in most Syracuse, New York neighborhoods; falling roof ice and dangerous ice buildup forming on roofs and ledges of homes and businesses. The need for a roof deicing system has long since been the coveted solution, but installing a gutter or roof deicing system was perceived by many consumers as a luxury for the wealthy. However, as home and business owners learn about the benefits and affordability of roof deicing systems, more and more residents in Syracuse are now finding heated roofs to be an affordable and necessary investment. Safety for family and friends is always a concern, and safety for customers is at the forefront of the minds of business establishments. 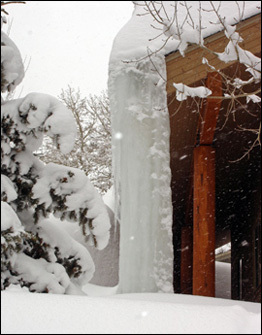 Ice dams and icicles that form in the winter months cause unnecessary hazards that most homeowners aren’t willing to put up with. Icicles can easily dislodge, and injure pedestrians below. Ice dams not only can cause expensive damage to roofs, but once a roof is damaged, the consequence can be expensive water damage to the interior of homes and businesses. Installing roof deicing heat cables is a simple and cost-effective way to prevent the winter hazards associated with living in Syracuse. Roof heat can easily be added to your roof eaves, thereby eliminating ice and snow in those areas. Heated roofs keep your home perimeter safe and reduce the risk of costly repairs that come with the destructive powers of winter – not to mention reducing the chances of litigation due to personal injury. Protecting your home, roof, pedestrians and loved ones with a roof deicing system offers safety and freeze prevention throughout the harsh winter months. Many homeowners in Syracuse, New York are praising the peace of mind that comes from the protection that roof snow melting systems provide. Warmzone offers roof heating systems and gutter heating cable for all types of applications and roofing surfaces, including new construction, remodeling, or existing roofs. For more information, call 888.488.9276 today.